Minnesota Mining and Manufacturing, or 3M (MMM), was founded in 1902 in St. Paul, Minnesota. The global industrial conglomerate markets over 60,000products used in homes, businesses, schools, and hospitals in more than 200 countries around the world. 3M is a highly diversified company with five main business segments that cover over 45 technology platforms, ranging from adhesives and abrasives to ceramics and nanotechnology. Industrial (35% of sales, 27% of income): tape, sealants, abrasives, ceramics, and adhesives for automotive, electronic, energy, food, and construction companies. Healthcare (19% of sales, 25% of income): infection preventions supplies, drug delivery systems, food safety products, healthcare data systems, dental and orthotic products. Safety & Graphics (17% of sales, 19% of income): personal protection and fall protection equipment, traffic safety products, commercial graphics equipment, commercial cleaning and safety products. Electronics & Energy (15% of sales, 17% of income): insulation, splicing and interconnection devices, touch screens, renewable energy components, infrastructure protection equipment. Consumer Products (14% of sales, 12% of income): post-it notes, tape, sponges, construction & home improvement products, indexing systems, and adhesives. 3M has paid uninterrupted dividends for over 100 years and raised its annual payout for 60 consecutive years, making it a dividend king. 3M's dividend track record is among the best of any company in the world. When combined with the firm's consistently high operating margins in excess of 20% and excellent long-term track record of creating value for shareholders, it's no surprise that this industrial conglomerate has a number of competitive advantages. First, many of 3M’s products are economically attractive because they represent a small cost of the total product or project the customer is working on but are often mission-critical to the outcome. For example, 3M supplies structural adhesives to automotive manufacturers. 3M’s adhesives bond plastics and metals together and must maintain their strength throughout the entire car’s life. The company’s brand, technology innovation, industry-leading reliability, and favorable product dynamics (a low portion of the car’s total cost) provide nice pricing power, and it’s simply not worth risking the reliability of a vehicle for the original equipment manufacturer to switch suppliers. Another benefit 3M enjoys is that about 50% of its products are consumables, meaning that customers need to continually repurchase them. The result is a far more stable cash flow stream for the company. Simply put, 3M has a very sticky product line that allows it to steadily increase its prices each year while retaining strong customer loyalty and a rising market share. This is why its industrial segment has historically grown at 1.5x the rate of the global manufacturing components industry. The company's moat goes beyond product dynamics, however. 3M’s management team, led by new CEO Mike Roman, has implemented a culture that embraces Lean Six Sigma and actively manages the company’s numerous operating divisions based on their profitability and growth characteristics. If a division is underperforming, 3M will take action to bring its returns up to an appropriate level and is not afraid to shed weak assets. Roman replaced former CEO Inge Thulin (a 40-year company veteran) in July 2018. Mr. Roman has spent over 30 years with 3M, having served as COO as well as been in charge of international operations of each of 3M's five segments. In other words, he appears to be a solid replacement and will likely continue leading 3M down the same successful path. 3M's management also understands the importance of maintaining a continuous dedication to strong R&D and new product development. Over the past 115 years, 3M has obtained over 100,000 patents thanks to one of the industry’s highest R&D budgets (as a percentage of revenue). 3M also has a unique ability to leverage its R&D investments since many of the company's technologies are relevant across various end markets with only slight tweaking. As a result, 3M is able to more efficiently improve and expand its product range to take market share and remain relevant. In fact, management has previously estimated that about 33% of the firm's sales are from products launched in just the past five years. To achieve this success, 3M historically spent about 5.5% of sales on R&D. Going forward, management plans to invest 6% of sales on R&D (about $2 billion annually), as well as 5% to 5.5% on growth capex, to expand its strongest business units. This is part of the company's latest five-year capital allocation strategy, which sets aside about 30% of operating cash flow for safe and growing dividends. However, the top priorities are investing in organic growth initiatives and acquisitions (more on this in a moment). Besides investing for growth, unlike many sprawling conglomerates, 3M has adapted to changing industry conditions by consolidating its operations and divesting struggling business units over time. In the last six years, for example, 3M has streamlined its number of operating divisions from 40 to 23 and sold off over 10 underperforming units for $2.1 billion. Some of the businesses it sold include: identity management, electronic monitoring, tolling and license plate converting, prescription safety glasses, noise monitoring, protective films, and cathode batteries. Each of these units, which combined had $1.1 billion in sales, suffered from flat organic growth and had an average operating margin below 5%. Thus by selling them, 3M was able to redeploy capital into businesses with higher margins and faster growth potential. 3M expects these technology platforms to achieve annualized sales growth of 10% to 15% from 2019 through 2023. This strong focus on serving the industries of the future is largely why management believes 3M can deliver overall annual organic sales growth of 3% to 5% in the coming five years. 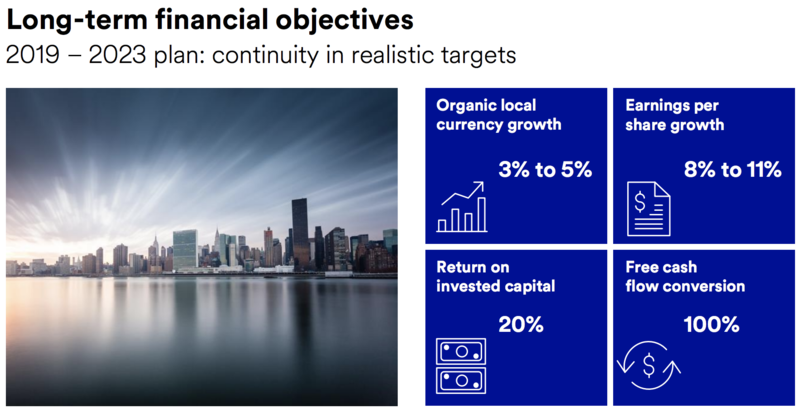 Combined with ongoing cost-cutting activities, share repurchases, and occasional acquisitions, the company expects that it will deliver EPS and free cash flow per share growth of about 9.5% per year for investors. The firm's dividend would likely grow at a similar pace. While we've already looked at 3M's plans to achieve 3% to 5% organic sales growth, let's take a closer look at management's ambitions to improve margins and continue making acquisitions. Starting with profitability, one of 3M's historical strengths has been its large economies of scale which allow it to run some of the most cost-effective manufacturing, distribution, and supply networks of any company. Over the past four years, 3M has been working on a $500 million to $600 million cost-cutting plan that involves further improving its economies of scale. That plan is now 75% complete and involves closing down over 30 factories while moving their production to ones it has improved through automation. This is just the latest example of how 3M is continuously looking to cut costs and maximize its competitiveness. In fact, the company has retrained more than 75,000 employees and completed over 110,000 efficiency improvement programs since 2001, resulting in over $17 billion in cost savings. Acquisitions are an equally important component of 3M's corporate strategy. Management targets small, bolt-on deals, as opposed to large and potentially overpriced mergers that many of its rivals pursue. In fact, over the past six years, 3M has made 12 bolt-on acquisitions totaling $7.7 billion, or an average of $640 million each. 3M's bolt-ons are typically chosen to complement its existing strong business lines. For example, in December 2018 3M paid $1 billion to acquire M*Modal, a leader in Artificial-Intelligence powered medical transcription software for doctors. 3M is paying 10 times adjusted annual EBITDA for this private firm, which generates $200 million in annual revenue. That's less than 1% of 3M's annual sales, but remember that the firm's acquisition goals aren't to move the needle on sales, but to improve its existing businesses. In this case, M*Modal will strengthen 3M's healthcare information unit, which serves thousands of global healthcare organizations. The success of 3M's disciplined M&A strategy can be seen in the firm's consistently high return on invested capital, or ROIC. ROIC divides a firm's profits by the money both equity and debt holders have given the company to gauge management's capital allocation skill. 3M's ROIC has remained above 25% in each of the last 10 years, an impressive achievement considering most firms earn a return below 10%. Finally, it should be pointed out that 3M's historical success is also thanks to its conservative use of debt. Despite plans to invest aggressively in growth projects and step up share repurchases in the years ahead, which management expects will increase 3M's net debt load by $5 billion to $15 billion, the firm's balance sheet should remain strong. 3M enjoys an AA- credit rating today, and management's guidance implies 3M's net leverage ratio will likely remain close to 2.0 or below in 2023 (compared to about 1.9 today). Basically, if 3M can deliver on its growth plans, then it's balance sheet should remain strong and continue providing financial flexibility for the company. While 3M is among the highest-quality industrial companies in the market, there are still several risks current and potential investors need to consider. Most notably, virtually all industrial stocks will experience cyclical growth or declines over short periods of time. Trade wars, commodity price volatility, economic slowdowns, and foreign currency exchange rate fluctuations are just some of the many uncontrollable macro factors 3M must contend with. Fortunately, none of these issues are likely to impair 3M's long-term earnings power. The company'’s efficient operations, high mix of consumables, and broad portfolio diversification also mean that its overall earnings and cash flow are far more stable than the typical industrial firm. If anything, a temporary pullback driven by short-term growth concerns is probably a buying opportunity. Given 3M's diversified operations, excellent balance sheet, and numerous opportunities for long-term growth, it's hard to imagine a world in which the firm is no longer relevant. When it comes to industrial businesses with long track records of dividend growth, 3M is one of the most impressive companies in the market. From its disciplined management team and diversified product portfolio, to the company's strong balance sheet, substantial scale, and protected technologies, 3M seems like a dependable choice for many dividend growth portfolios at the right price.